There’s a golden rule about cruise fares: Prices are cheapest when school is in session. The reason is simple. When the kids are out of school — Spring Break, Christmas holidays, and summer — families have an easier time with being able to take time off to cruise. That leads to more demand for cabins. When school is in session, however, it’s hard for families to find the time to set sail. As a result, cruise lines slash prices to fill up rooms. That means you can find some great deals as you look for a trip in the winter months. Below, we’ve rounded up a dozen of these deals, all with prices of below $300. Most of them leave in the winter, with a few in the winter after Christmas holidays. We’ve also included links to the deals themselves. If you want to do your own search, you can do so on Orbitz. The fares shown below are at the time of writing and subject to change. All fares are for interior cabins, before taxes and port fees. Forget just a good deal, this cruise departing Long Beach is among the absolute cheapest in the entire country. For under $170 per person, you can set sail with port stops in Catalina and Ensenada. The trip departs January 13, and there are slightly higher fares available several times throughout the year. Learn more about this trip. At just $179 per person, you can’t beat the price of the cruise setting sail from Miami — the cruise capital of the world. It makes two stops: Key West and Cozumel before returning to port. The lowest price of $179 is available on September 21, but you can also sail on November 30 and December 7 for the same price. That’s still well below the $300 per person threshold. Learn more about this trip. Mobile isn’t a cruise mecca, but if you are within driving distance, then it’s a great option for good deals. This five-night trip departs on January 20, sailing round trip with a stop in Cozumel and Progreso. Best of all, it’s just $244 per person for an interior cabin. Compare that to the same cruise departing on May 11 that costs a rate of $379 per person. Learn more about this trip. Similar to another cruise on our list, this trip departs from Miami aboard Carnival Sensation, with stops in Key West and Cozumel. For just $214, that’s a great deal. What we like best is that it departs on a Thursday and returns first thing Monday morning, meaning you only have to miss a couple of days work to set sail. Learn more about this trip. This four-night sailing is pretty basic. 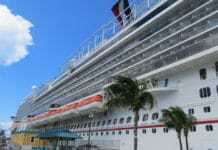 It leaves New Orleans in December for a cruise that ports only in Cozumel, Mexico. Still, it does get you to the Caribbean during the coldest part of the year in the United States… and it does it for a rock-bottom price. Learn more about this trip. Tampa isn’t as big a cruise port as other Florida ports like Miami and Fort Lauderdale, but don’t sell it short. This trip is a simple round trip getaway calling on Cozumel. At just $249 per person, it’s cheaper than buying a flight to the Mexican Riviera and comes with a four-night vacation that includes meals and room. If you can’t sail on January 9, there are other dates available for low rates, including $259 for a departure on January 23. Learn more about this trip. If you notice, all the cruises until now have been mostly for four nights. Want to make the deal even better? How about five nights for less than $300? This sailing aboard Carnival Valor stops in Cozumel and Progreso from New Orleans at a price of only $279 for an interior cabin. In addition, we found more than a dozen more sail dates for slightly more, but still under the $300 threshold. Learn more about this trip. Another five-night trip, this sailing aboard the Carnival Paradise leaves Tampa, with stops in popular Grand Cayman and Cozumel. You’ll leave on November 30 but but you can sail on other dates for the same price. At $279, it represents a great deal for a five-night vacation. Learn more about this trip. For much of our list, you’ll notice that the only option is Carnival. However, MSC is a smaller cruise line that offers some pretty good deals. This trip is not only $169 per person, but it also is in the middle of Spring Break — one of the most expensive times to sail. You’ll stop at Ocean Cay and Nassau before returning to Miami. Other dates are also available at this price. Learn more about this trip. Didn’t think you could afford an inexpensive cruise aboard a luxury line like Celebrity? Think again. This five-night trip close to Thanksgiving will take you across the Gulf of Mexico to Key West and Cozumel for just $289 per person. You won’t find many cheaper trips aboard Celebrity. And if the date doesn’t work for you, there are two more trips in December at this price. Learn more about this trip. We found just one trip from Galveston that was under the $300 threshold. It’s this five-day cruise that departs January 20, 2020 aboard the Carnival Dream. You’ll make stops in Cozumel and Progreso, Mexico, along with two sea days. If you want to spend a little more, there are a few Royal Caribbean trips from the island that are a shade over $300 per person. Learn more about this trip. The final cruise on our list is a five-night trip aboard Carnival Sunshine. Coming in at $299 per person, you’ll get to stop in Ocho Rios and also popular Grand Cayman. The trip departs in late November, just in time for it to start getting cold in the northern part of the country. Learn more about this trip.